Rotorua lies in the middle of New Zealand’s North Island and is famous for its geothermal attractions, maori culture and its abundant outdoor activities. It is quite possibly the stinkiest town I have ever visited, thanks to the sulphur in the area, but after a few hours, the smell does not seem to be annoying. There are plenty of places to visit in Rotorua for everyone. Our visit to Rotorua was all about multi-generational travel. My boys are 6 and 4 and along with my parents, we explored the area for three days! 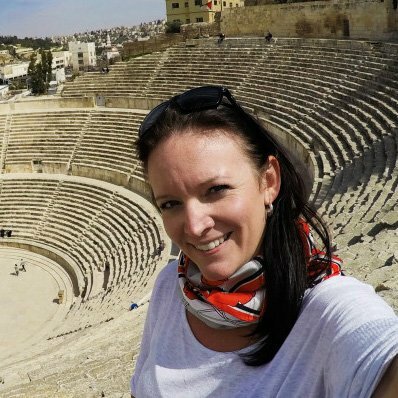 There is so much in the region, I have hi lighted the best things to do in Rotorua and a bit of something for everyone. What are the free things to do in Rotorua? Have you ever seen a MUD VOLCANO? We spent the morning at Hells Gate, just north of the main city centre of Rotorua. 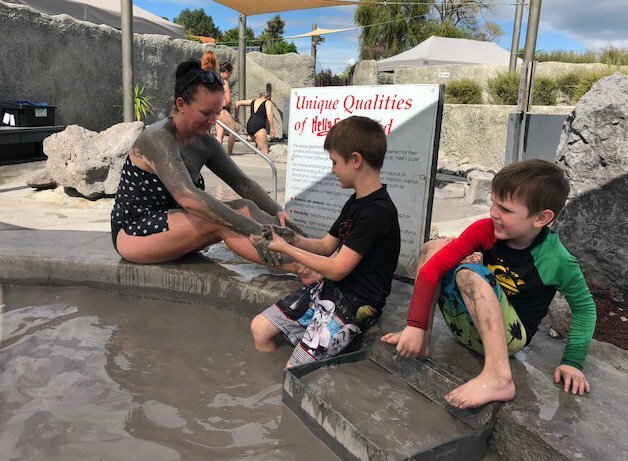 This was one of my favourite things to do in Rotorua as it had something for everyone in our family. Rotorua geothermal areas are plentiful and amazing to experience (once you get over the rotten eggs smell) but this one was my favourite. Why? Hell’s Gate Geothermal Reserve is 50 acres of a large variety of geothermal features! Wandering past the hot pools you will see bubbling mud, steaming water, a large mud volcano as well as cooking pools and a medicine lake. Hell’s Gate is different from other thermal reserves as the heat source is only 1 km below the surface. After exploring the mud pools and cooling off in the bush walk, we were treated to the spa where we first covered outsells in Mud and then relaxed in the natural hot pool! 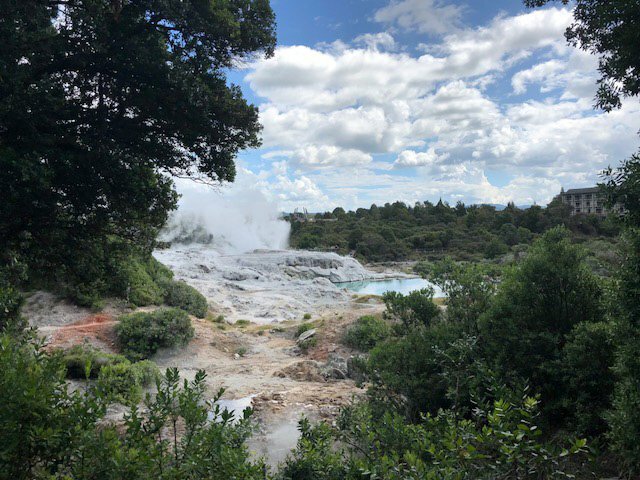 As one of Rotorua’s natural attractions, I highly suggest you take some time to experience the geothermal wonders in the region. Whakarewarewa: the living Maori village is another Rotorua geothermal park worth exploring. 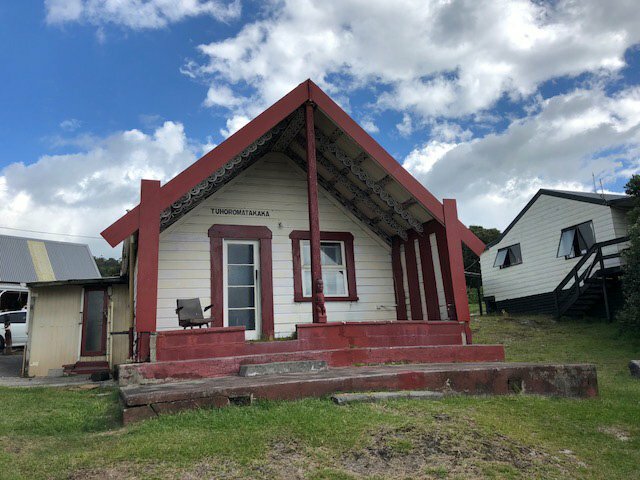 It is also a rich cultural experience as it is a village inhabited by Maori”™s of today and has been inhabited for over 200 years. 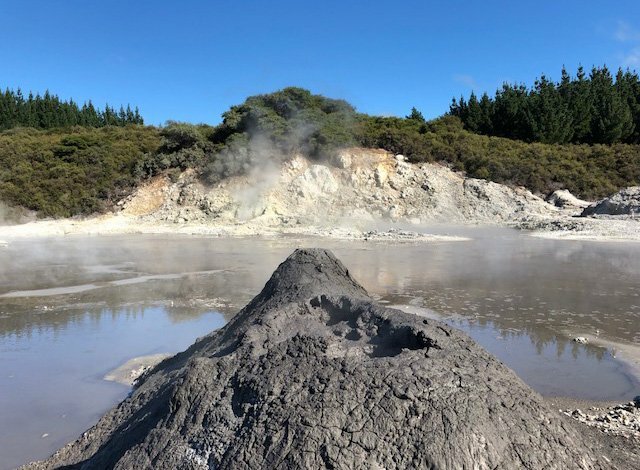 Friendly local guides give tours of the village and hi light the maori culture, the geothermal wonders of Whakarewarewa including the Pohutu geyser, boiling mud and steam vents. It is also somewhere where you can experience the Haka in Rotorua. You can also try a geothermal hangi meal at this Rotorua geothermal area. If you want more geysers and mud pools, Rotorua Tourism has a list of geothermal attractions here. There are plenty of things to do in Rotorua, New Zealand for people of all ages. These have been our must-do places as we have 6 and 4 year olds as well as my parents. So something that appeals to kids and adults was our target in Rotorua. One of our favourites was the tree top walk with Redwoods Treewalk. My 6 year old was the leader as we climbed and walked among the giant California Redwoods. Redwoods tree walk was one of the great things to do in Rotorua with kids because it got us out into nature and to explore the forest, had some excitement for the kids as we walked from tree to tree on the platforms and was easy for my parents, who are still quite agile, but not into adventure. You can do this during the day or do it as one of the many Rotorua night activities. 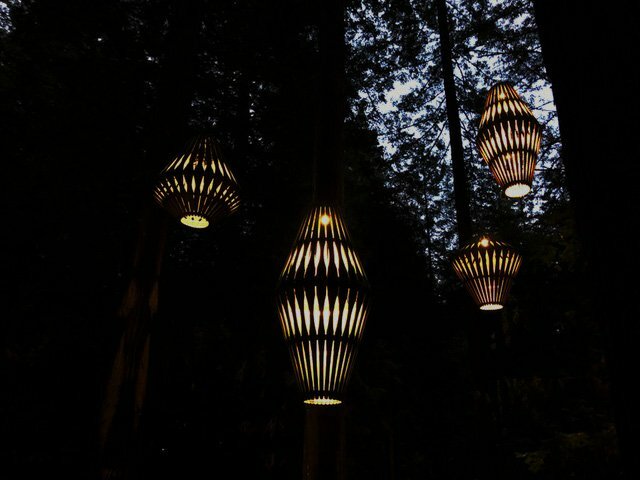 At night it is really cool to see the lanterns in the trees light up in the forest! We went just before dusk so we could see both light and dark. 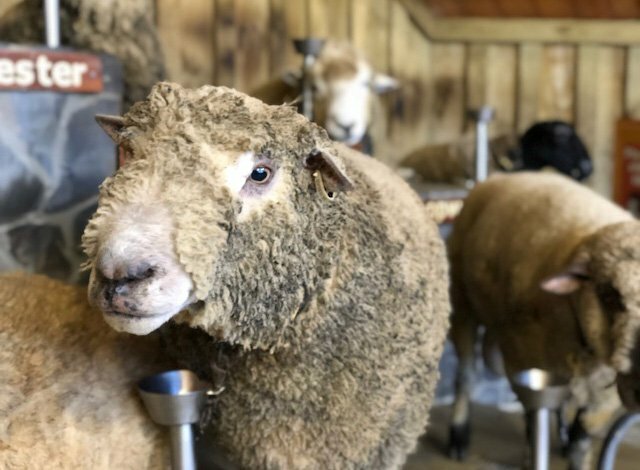 Watch the Agrodome sheep show to see all of the kinds of wool and different sheep from around the world! 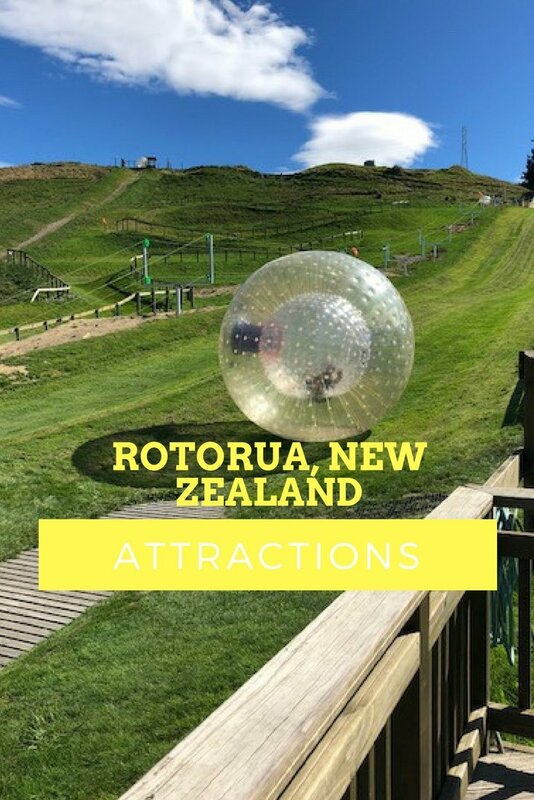 One of the top 10 things to do in Rotora and a typical Kiwi experience in New Zealand was to visit the Agrodome and watch the sheep shearing show! The types of sheep they had were amazing and you can learn about the wool industry as well as the importance of sheep and cows in New Zealand. This is a great place for animals lovers and those who want to learn about New Zealand”™s farming. Take the tour and you will see kiwi fruit, alpacas, sheep and cows, as well as try local honey! Rainbow Springs is probably one of the only places you will see a real, live kiwi, since they are nocturnal. See them digging for grubs in the specially crafted nocturnal habitat, where they think it is night, and you can see them through glass. There is also a kiwi experience where you can learn about how kiwis are being protected, and how Rainbow Springs is helping with breeding. Did you know it takes over 4 days for a kiwi to hatch! No wonder few make it to adulthood when they are left defenceless trying to get out of their shell. They really are an interesting creature! While at Rainbow Springs take their water ride, the kids wanted to ride it all day! Rainbow Springs showcases New Zealand”™s unique animals and plants. You can see the Kiwis, reptiles including the Tuatara, birds in an Aviary, trout in a huge pond (grab some food to feed them at the entrance) and Big Splash! Big Splash is a 9 minute water ride with a thrilling water drop at the end! My 6 year old loved it and wanted to go again and again. The minimum height is 106cm (about 42 inches). Rainbow Springs also has a great playground for the kids! There cafe serves yummy lamb burgers so get one while your kids have some play time! This is one of the Rotorua tours for the whole family. Rotorua Duck Tours is a sightseeing adventure on land and water and is a great way to appreciate Rotorua. A converted WWII landing craft will show you around the city on a 90 minute or two hour tour. You will hear stories of the rich history of the region and enjoy the beautiful waterways in Rotorua. How about rolling down a hill in a ball full of water? Downhill ball rolling was invented in Rotorua and the inventors now run on OGO Rotorua the original hill where downhill ball rolling was invented! 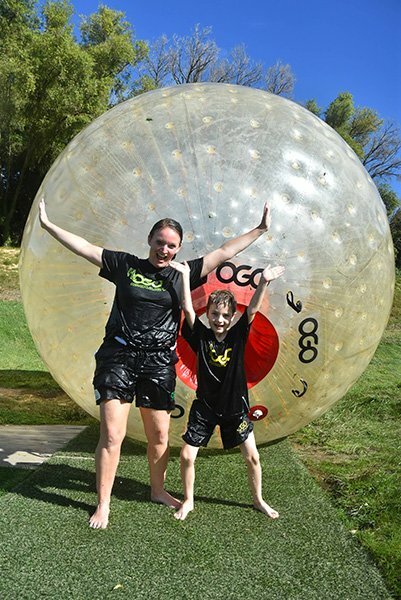 If you want to know what to do in Rotorua for some wet fun and adrenaline, check out OGO! My 6 year old Mattias and I enjoyed slip, sliding down the three tracks and have some fantastic go pro footage! Your visit includes photos which is a nice keepsake from your time at OGO. In between your rides, you can hand out in the Hot Tub keeping you nice and warm on cooler days! There are three different tracks to try out and you can go by yourself or with one or two other friends in about 40 litres of water. Check out Viator.com for a deal on your visit! It can get expensive with all of the things to do in Rotorua, but there are plenty of fun things to do in Rotorua that are free. Because it is natures”™s paradise, the outdoors is your playground. For the water lover, there are 18 lakes and three rivers in Rotorua. If getting out on the trails is your thing, there are excellent mountain biking and hiking trails. 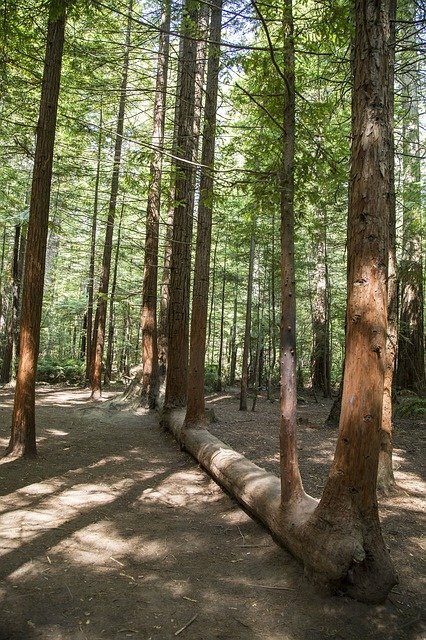 Whakarewarewa Forest has the best walks in Rotorua and is home to plenty of short walks and longer walks, as well as lake walks.… It also has over 130 kilometres of mountain bike trails and horse trails as well. If you are like me, and want to enjoy traveling in comfort or hiking with that barefoot feeling, check out this z-trail review sandals for amazing sport sandals for hiking. Each Thursday Tutanekai Street comes alive with plenty of food vendors to satisfy any craving. You will also fine crafts, music and produce. Locals and tourists mingle and wander the streets in the great community event. 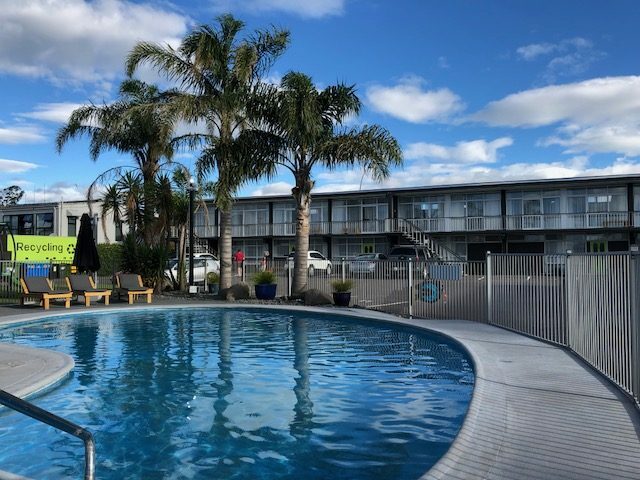 We were lucky that Aura Accommodation”™s staff recommended it as soon as we checked in as something we should not miss while in Rotorua. The beautiful lake is perfect for a stroll or swim, or a nice place to enjoy an ice cream. 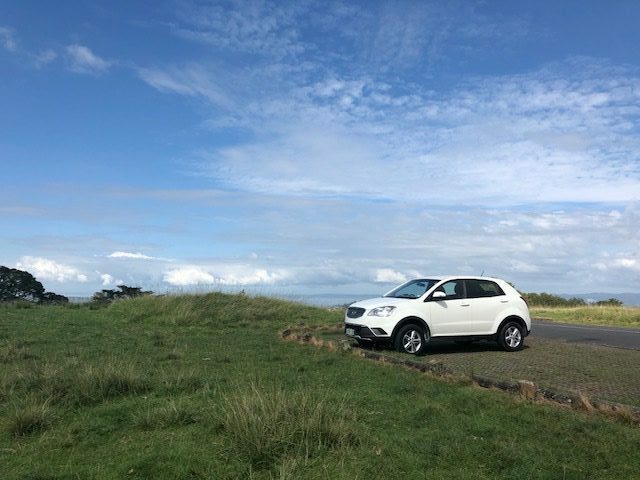 We had a car from Rad Car Hire Rotorua for our North Island Road Trip. The booking was simple and efficient and their price for vehicles was great! You can drive or fly into Rotorua. Driving time from Auckland is just under 3 hours and from Hamilton just one hour. We stayed at Aura Accommodations close to the lake and loved everything about it. The rooms were bright and it was family friendly with free bikes and scooters to sign out. 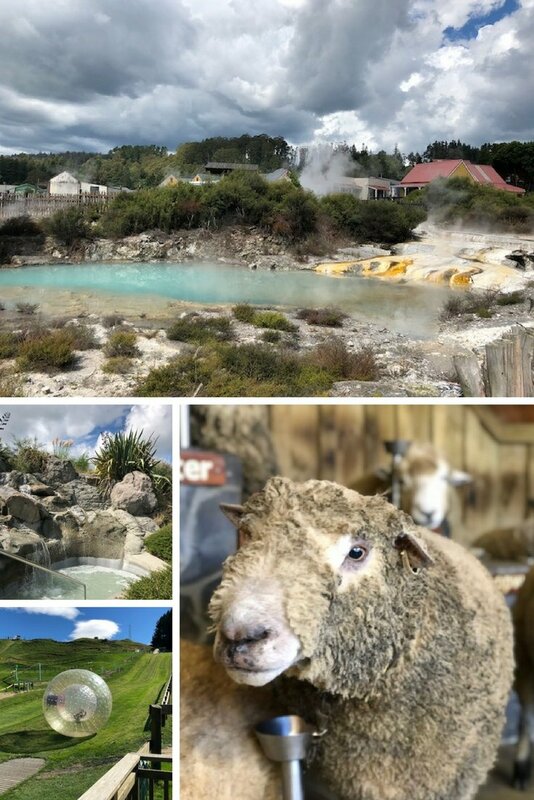 It also had a trampoline, a thermally heated swimming pool and two private hot pools to enjoy the mineral waters that Rotorua is famous for. Got a Place that I missed? Tell me about it in the comments! Most people probably can’t understand about the sulphur smell. We have been to Yellowstone National Park and the smell was so strong it does affect you. The geothermal attractions are worth the smell though. The downhill ball rolling sounds amazing! I like the sound of hanging out in the hot tub, so Rotorua has something for everyone. So jealous, Rotorua is on our bucket list. The geothermal pools look a great way to spend the day. The OGO ball looks like a blast! Rolling downhill in a ball of water sounds really cool!!! I am so happy the kids seem to enjoy the geothermal attractions even with the smell! Worth trying! Lovely list of things to do in Rotorua! Iâ€™m curious to know if there are residents living near the sulphur area. Iâ€™ve been on one of those and I can just imagine the smell. Anyway, Rotorua looks amazing and I too would love to visit the volcanic park and enjoy the mud pools. I hear its good for the skin and your health too! YES there are houses that are literally RIGHT BESIDE thermal vents! it is insane!! I would love to visit Hells Gate Geothermal Spa! I’ve never been in a geothermal spa/pool before, and it sounds relaxing. That tree top walk also sounds like a blast! Hells Gate was one of my favourites! Treetop walk and night market seem to be 2 things we missed out on, when we went to Rotorua 2 years ago. Apart from the geysers and the geothermal spa, it was not actually one of my favourite places to visit in New zealand, considering how much beauty is strewn across in that country. I also found the smell in the city quite strange, maybe because of the geothermal activity. Having said that, it is definitely a short stop I would recommend to include in a NZ itinerary of the North Island. I didn’t know you could do downhill ball rolling in the UK! Awesome! i loved Rotorua. Like you, Hells Gate Geothermal Spa was my favourite too. Unfortunately, I could only spend 3 days there. The smell was too much for me to handle. Really? I got over it on the first day … once and awhile it would hit me. Too bad it bothered you so much but glad you liked the Hells Gate Spa in Rotorua! I could have spent hours there and there are so many things to do in Rotorua it is so hard to do everything!